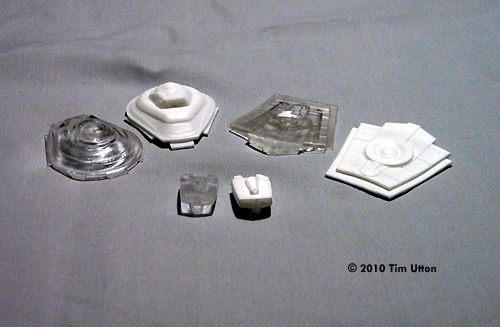 Parts: 3 cast in white or water clear resin. Decals: 2 waterslide decals are included for the impulse engine (exhaust grills and details). 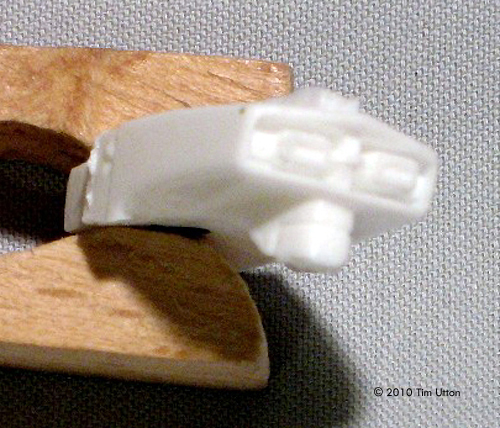 Molding Quality: 8 - Details are sharp, clear, and in scale…especially on the tiny torpedo launcher! Detail: 9 - Given the tiny size at 1:1000, the level of detail is incredible. Accuracy: 9 - All parts are far more accurate than the Polar Lights kit, and are properly sized to scale. Proportions on the impulse engines are correct. Overall Rating: 9 - An incredible bargain that will greatly improve an already excellent kit. Round 2's "Polar Lights" brand issued a 1:1000 kit of the Enterprise Refit late last year; it was the first time the Refit had ever been made available in that scale. Star Trek modellers had waited a long time for a new (and affordable) kit of one of the most beloved starships of all time. While the kit was fairly accurate and built up into an attractive model, the limitations imposed by injection styrene technology and budget resulted in some features being a lot less detailed than was expected. The bridge assembly was missing detail in the sensor dome, and the “B/C” deck structure was slightly oversized and missing detail. Worst of all, the docking port on the aft of the bridge module was represented only by a decal. Enter upstart garage kit company Tetryon Parts. Their first product was a replacement bridge and B/C deck intended to address these problems. Just recently, Tetryon added two new products to their line up: an impulse engine assembly, and a torpedo launcher. All three parts are available separately or as a complete “upgrade pack”. First up, the bridge module. The Polar Lights parts were characterized by too much detail on some areas, and not enough on others. The Tetryon parts strike the perfect balance for this scale, by eliminating raised panel lines on the sides of the bridge. The small rectangular panels on the B/C deck “indent” are well represented, and most importantly, the docking port and surrounding braces are finally modelled in three dimensions. The overall size of the B/C deck has been adjusted as well, to make its proportions and size more accurate. The impulse engine assembly has also been meticulously tweaked. The extraneous and out-of- scale details as well as improperly shaped impulse exhausts on the Polar Lights part have been replaced with a single accurate and highly detailed part. The impulse crystal is cast integrally with the part itself, as opposed to the standalone clear styrene piece that comes with the Polar Lights kit. 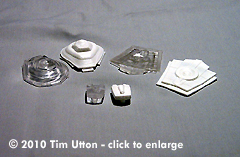 However, this shouldn’t present any challenges for modellers who wish to light their build; the impulse engine, like all Tetryon products, is available in either clear or white resin…which, by the way, is sufficiently thin enough to allow light passage if one desires. Three tiny decals are included with the impulse engine: port and starboard exhaust grills, and a set of panels for the portion of the engine that divides the two exhausts from each other. Details are sharp and beautifully printed. However, modellers should be aware that the engine grills are available in black only at this time. Colour decals would have been a nice option, but considering that they’re included with part for free, they’re still an excellent deal. Besides, you can always use some clear red, orange, or blue to tint them after they’re in place (as I plan to do with mine). However, the real gem of the Upgrade Pack is the Torpedo Launcher. 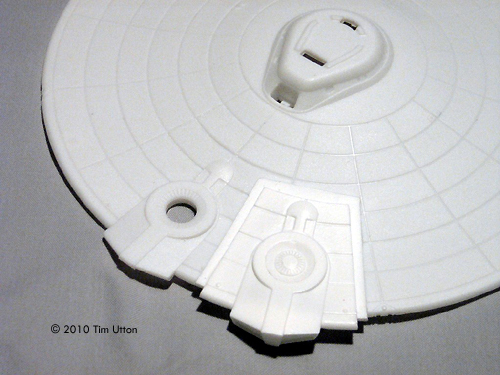 The Polar Lights part is basically a clear piece of styrene with very elementary shapes protruding from it to represent the torpedo tubes. However, Tetryon has managed to sculpt an incredibly detailed…and accurate…torpedo launcher. Despite the tiny size of the part, all the familiar details are there, from the recessed bay, to the ribbed launcher tubes, to the tiny greeblies inside. All parts are engineered to seamlessly “drop in” to the Polar Lights kit. Some very minor surgery is required to remove the existing B/C, impulse section, and torpedo launcher, but pains have been taken to ensure the new parts don’t look out of place. Minor puttying will be required to ensure a flawless blend; however, one doesn’t need a great deal of skill to install any of the replacement parts. Instructions for all the parts are straightforward and liberally illustrated with photographs, and can be downloaded for free from the Tetryon website. Perhaps the best feature of the Tetryon products is their low price. The Upgrade Pack is available for a paltry $20 for the opaque version, or $25 for the clear version. Shipping is a flat $5 anywhere in the world. If you wish, you can also purchase the parts separately (prices range from $4.00 for an opaque torpedo launcher to $13 for a clear bridge). The Tetryon website is set up for online ordering with PayPal, which makes shopping a breeze. Given the price, quality, and detail of these parts, I can’t imagine a serious modeller not benefiting from purchasing the upgrade pack. Not only will they look fantastic on the 1:1000 refit, they are also just inexpensive enough to encourage their use in kitbashes and conversions involving all the other 1:1000 Star Trek kits on the market. I’m exceptionally pleased with these parts, and am eagerly looking forward to whatever Tetryon produces next. Many thanks to Tim's wallet for providing the review samples. Manufacturers and retailers, interested in getting your wares reviewed and publicized on a site averaging 6000+ readers a day? Contact us! This page copyright © 2010 Starship Modeler. First posted on 18 November 2010.